Being part of a family of avid video-gamers, there is no way I could miss the influence of Mario Brothers on my earlier life. I quickly learned that mushrooms were treats and turtles were the enemy. I’ve often wondered if this is what spurred my love of mushrooms but who knows. Mushrooms have a pleasant roundness to them, you must admit. Give it a try and tell me what you think! Rounds 1-2 of stem pattern measure 1.25” (3 cm) with crochet hook J, and 1.5” (3.5 cm) with crochet hook H.
Finish off, leaving a long tail for sewing. Fill cap with fiberfill. With the long tail and a yarn needle, * go up into bottom center of cap and pull out the top. Go back down through cap top and out the bottom, repeat from * a few times until the cap is sufficiently pulled in underneath, being careful not to pull too tight. Weave in ends, and tug at the top of the cap to reshape. With color C (black in photo), embroider eyes on stem with a yarn needle. Add beans to stem and fill the rest of the way with polyester filling. Sew top of stem to bottom of cap. Repeat rounds 1-2 of stem. Finish off, leaving a long tail for sewing. Repeat rounds 1-3 of stem. Finish off, leaving a long tail for sewing. Sew circles to cap in random spots. I hope you enjoy making this little guy as much as I did. If you have any questions leave a comment down below and I’ll help you out as soon as possible! This entry was posted on Thursday, August 22nd, 2013 at 9:11 AM by Amy	and is filed under Free Crochet Patterns. You can follow any responses to this entry through the RSS 2.0 feed. You can skip to the end and leave a response. Pinging is currently not allowed. Hi! I love your mushroom. I made it and posted a picture on the german crochet-Facebook-group. They like him also, but there are many people that only speek german. So I would like to translate your pattern and make a file. Of course with your name and a link to your pattern. Tell me please, if you allow this. I would send the file also to you. 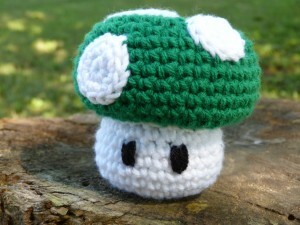 I am pleased you like my little mushroom! You may translate the pattern as you have requested with the link to the original. I can’t wait to see the translated pattern!